China's first astronaut launched to space says he thought he was going to die aboard Shenzhou-5 during the shaky ascent of the historic flight of his Long March 2F rocket. On October 15, 2003, Yang Liwei made history with the clandestine Shenzhou-5 crewed mission, which lifted off from the Jiuquan Satellite Launch Centre in the Gobi Desert. The mission, which made China only the third country to independently put a human in space, was only announced after Yang had successfully orbited the Earth 14 times and landed safely in the grasslands of Siziwang banner, Inner Mongolia, 21 hours after launch. But things did not proceed anywhere near as smoothly as first thought. Years later, Yang has been openly talking about his experiences and fears during the flight. Speaking at China's annual parliamentary sessions in Beijing on March 10, as a member of the national committee of the consultative body, the CPPCC, Yang explained he that he thought he was going to die during the launch. 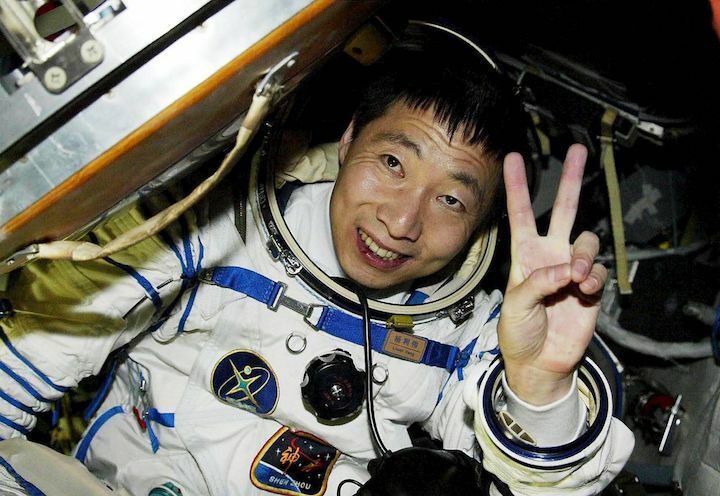 "I was afraid I was going to die," Yang recalled, as reported by China.org.cn, as he went through 26 seconds of turbulence before the spacecraft finally ceased shaking threateningly. Coming out the other side, Yang said he remembered hearing someone at ground control shout, "You see, he is still alive!" Eric Berger, a space journalist at Ars Technica, wrote last year that what Yang experienced was likely 'pogo oscillation', named as such as the rocket begins vibrating with an action like a pogo stick. "This is caused when the engines of a rocket thrust at slightly different levels, causing differences in acceleration across the rocket, and introducing variations in the flow of propellants," he writes. Berger, who recently wrote an in-depth series to mark the 50th anniversary of the start of the Apollo program, notes that NASA experienced this phenomena during the uncrewed Apollo 6 mission, launched by the largest ever rocket, the Saturn V.
Yang also talked of the spirit of sacrifice and commitment displayed by his fellow astronauts, notably Nie Haisheng. The day before the Shenzhou-7 mission, which would see China's first and so far only extravehicular activity, EVA or space walk, Nie's mother had a cerebral hemorrhage, leaving her unable to speak. Faced with worry and guilt for leaving his mother in order to take part in the flight, Nie's brother told him, "Go carry out your mission without worry. We are brothers - one for the country, one for the family!" His crew mates for the mission, Zhai Zhigang and Liu Boming, also faced technical problems during the mission, which included difficulties opening the hatch in order to enter and exit the Shenzhou spacecraft for the space walk. Earlier in the month Yang spoke of a third recruitment round of astronauts, which will, for the first time, be open to civilians. The upcoming Chinese Space Station, with the core module of the low Earth orbit facility expected to launch in 2020, requires mission specialists, scientists and engineers to help fulfill its planned objectives, whereas Shenzhou missions have so far been crewed by astronauts drawn from air force pilots. China's 16 current active astronauts are already undergoing for training for space station missions, including EVAs and construction and maintenance tasks.